Have you ever run across a great keyword and after spending eight months to rank it, discovered that it isn’t so great after all? In SEO, there are a ton of discussions about on-page SEO, link building and more pieces on “great content” than I would even like to acknowledge. There are even a ton of great guides talking about how to find keywords. Every one of those tasks is very important if you want to generate traffic, leads and sales, but they are not the only tactics you need to be aware of. You can uncover good keywords using research tools. While you are using the following process to test keywords, you should begin the basic on-page, content creation and link building. The following tactics will allow you to refine the terms you are targeting and test their likelihood of converting. Let’s turn for a moment to Google AdWords. If you look at how it is structured, you get your first glimpse into how best you could organize your own website. For those of you not familiar, you have campaigns, ad groups and ads. Each ad group has its own set of keywords that will trigger the ads to display. •	Broad – This is the most generic setting. If someone types in a word Google deems to be related to your search term, it will show your ad. 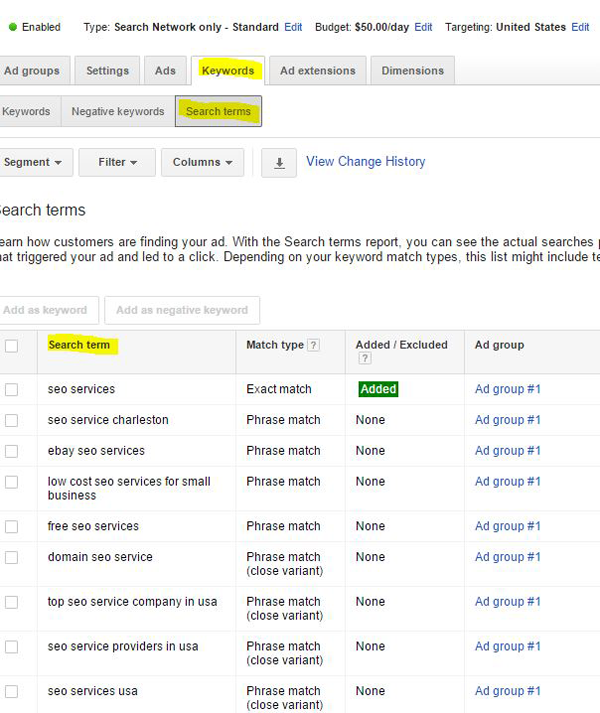 •	Exact – This match type only shows an ad whenever the keyword searched matches your listed keywords exactly. •	Phrase – This match type falls in the middle of the other two. It will not display ads for terms synonymous with your targeted keywords, but it will show your ad when searchers add terms before or after your targeted phrase. For example, the phrase match keyword “link building services” would show if some types “best link building services”, “top link building services”, worst link building services” etc., unless you prevent them from showing with negative match keywords. Now that you know how the three match types work, let’s get into how to use them for keyword research, but first, we need a seed list of terms. 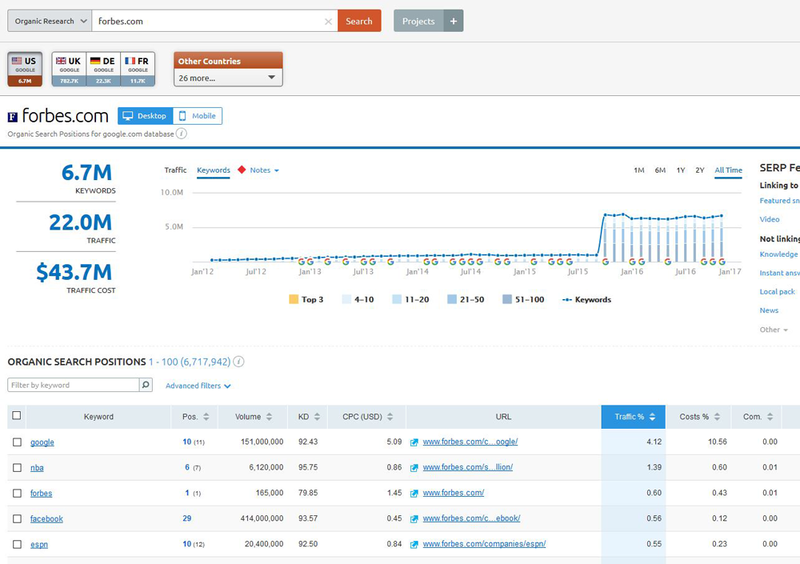 There are a lot of tools that will let you do this, but SEMrush is our tool of choice. The first thing you need to do is make a list of your top competitors. Once you have those, head over to SEMrush and put their url in the organic overview search bar. As you can see above, this will show you competitor keywords that rank in the top 100 and it will give you an estimate of how much traffic each keyword sends to the site. Export the list and repeat the process for your top 5-10 competitors. Once complete, merge all the exports into one Excel file and remove duplicates. You now have a list of terms that you know have search traffic. Once you have the list, go through the terms and group them by topic. If you have a narrow niche this won’t take long, but for a larger site is can take a while. Either way, take the time to group your terms. After grouping them, assign the groups to a landing page. If you see your group needs more than one landing page, you should further refine your initial groupings until all of your keywords have landing pages assigned. You now have the information you need to set up a PPC campaign to begin testing the terms. WordStream has a lot of resources on how to set up a PPC campaign so we won’t re-hash that here. If you aren’t familiar, go checkout the guide then come back. 1. Take the list of keywords from your initial research of competitors and create ad groups for each set of terms. 2. Create a couple of ads for your ad groups, again covered by WordStream if you aren’t familiar. 3. Once you have an ad group setup, we are going to change the keyword match type by clicking on the “keyword” tab, selecting the terms, clicking on edit, then change match types (see image). 4. From the screen, above, choose change match type from “broad” to “exact match”. 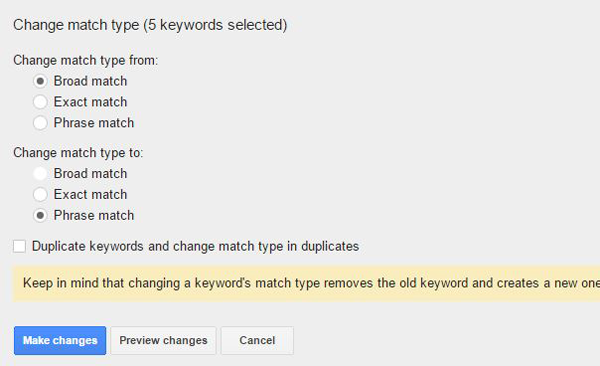 Repeat this process again, creating “phrase match” keywords as well, but this time check the duplicate keywords box. 5. Let your ads run for 15-30 days depending upon search volume of your terms and your budget. 6. Go to the keyword tab on your account and click the “search terms” tab to see the phrases that triggered your ad. 7. 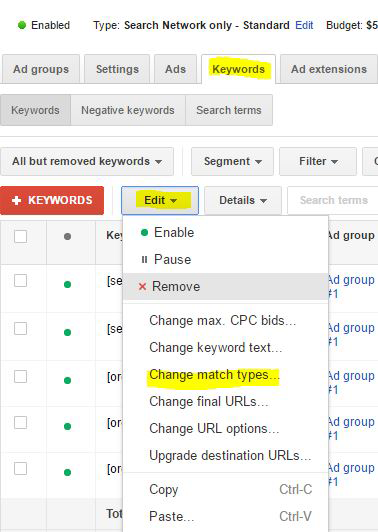 Now that you have a list of the exact phrases that triggered your ads, you can add these to your ad group as an “exact match” terms to see if the terms are searched regularly. 8. Let your ads run for another 30 days, then review the number of impressions for exact match keywords. 9. You now have a list of exact phrases that people are using to find your landing page, use that list to make sure your page is optimized for those terms. You now have real-time data on the search volume of your target keywords. Now we need to know if they are likely to convert. PPC is a fast way to test this. When you are setting up your AdWords campaign, be sure to set up conversion tracking. You can use Google Tag Manager to set up and manage multiple scripts. If you are not familiar with conversion tracking, check out the setup guide in AdWords help. Even simple goals like sign-ups, registrations and completed contact forms will give you great insight into which keywords best convert since conversions are attributed to specific keywords. Does this take a little more time and effort? Yes, but when you find terms with higher conversion rates and less SEO competition, it will have been worth it, not to mention you can get a snapshot of the demographics of those searching for your product or service. 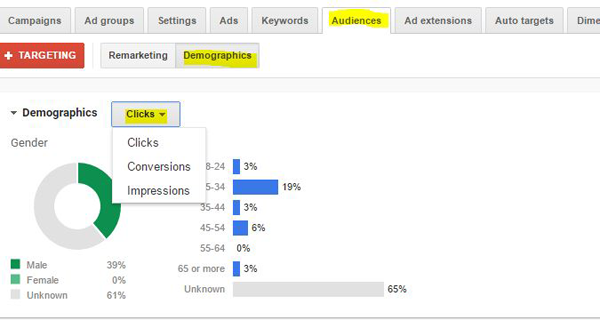 Above is an example of the data you can find when you click the “audiences” tab and then “demographics.” As you can see, you can also sort the data by impressions, clicks and conversions. Would knowing the average demographics of those buying your product be helpful in creating content? Creating your USP? If so, this is just one more reason to test your keyword with PPC. Even after you stop running ads, you will have a better idea of whom you are targeting with your landing page copy, making it easy to create content, offers and calls-to-action (CTAs) that convert. As Google continues to evolve, machine learning and AI will play a bigger role in SEO. What better way to acquire data and test outcomes that with Google’s own ad platform?